Scandinavian countries have a wide array of appeal in most heavy metal sub-genres. Although best known for their extreme death/black acts, there’s usually a percolating melodic or musicianship quality that provides enduring interest to these artists. 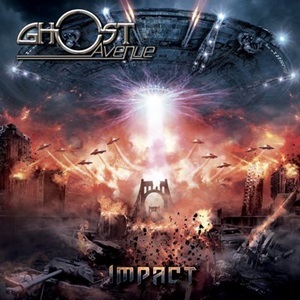 Norwegian act Ghost Avenue align on the 80’s heavy metal and classic rock side of the fence, together since 2002 as this third studio full-length Impact hits the marketplace. Previously privy to their self-titled release in 2013, we have a quintet that prefer to keep their riffing, tempos, and hooks more in a mid-tempo pocket, reaching for an overall strong band presentation that keeps the vocal/guitar action locked and loaded for prime connection. Choosing to go the conceptual route for the lyrics this time, the storyline tackles an alien invasion for earth and the subsequent battle for humanity’s freedom. On initial airing of tracks like “Dancing with the Devil” and slightly darker, low-end driven “Escape”, the stellar, gritty delivery of vocalist Kim Ihsak Sandvik sets Ghost Avenue apart boatloads from their contemporaries. He has the arena ready range and personality that reflect seasoning and experience, cut from the cloth of Ronnie Atkins of Pretty Maids, the much-missed Andrew ‘Mac’ McDermott of Threshold, plus the better aspects of Sebastian Bach during his Slave to the Grind period. Early Iron Maiden guitar aspects come in to focus for “The Prison”, although the rhythm section chooses to lay back into a comfortable groove to allow the marching strains from guitarists André Berger and Øystein Wiik ample room to shine, the emotive lead break in line with the main hook. The classic/arena rock feel comes in at times through special sound effects or simpler transitions, the type you heard in the 80’s from Dokken or Judas Priest to make “Time Traveller” and the power ballad “Construction” easy to click with a wider variety of followers. Impact is the type of record that won’t wow people immediately out of the gate – yet submits quietly into the brain/body recesses to the point that you’ll be humming or tapping along, ready for multiple playbacks. Not necessarily the flashiest or highest energy act going today, Ghost Avenue nonetheless deserve praise and attention for keeping 80’s-oriented, mid-tempo heavy metal alive, and this album proves well worth the investment.